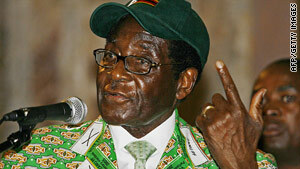 Zimbabwean President Robert Mugabe addresses the Zanu-PF party congress on Friday. Party passed a resolution earlier for setting up a "undisputed and decisive election"
Harare, Zimbabwe (CNN) -- Zimbabwean President Robert Mugabe says the fragile power-sharing government in his country "was given a short life" and he intends to reclaim control through new elections. "Elections are not far off," Mugabe told his Zanu-PF party Saturday. "The inclusive government was given a short life. The remaining part of it is short. In fact it has lived more than half its life." Mugabe's remarks come amid renewed tension between him and Prime Minister Morgan Tsvangirai. The two formed a power-sharing deal after a disputed presidential election that prompted months of controversy. The unity government has bickered constantly since it was formed in February, and Tsvangirai's Movement for Democratic Change party has accused Mugabe's Zanu-PF of human rights violations. One of the main disputes centers on Roy Bennett, a key MDC official facing charges of possessing weapons for sabotage, banditry and terrorism. Tsvangirai has called the delay in swearing in Bennett -- a nominee for deputy agriculture minister -- a deliberate attempt by Mugabe to send a message. Earlier Saturday, Zanu-PF passed a resolution to prepare and be able to run in a "undisputed and decisive election." Mugabe urged his supporters to have "a spirit of never to surrender your birthright" as they prepared for the elections, referring to his controversial land reform policy which targets white commercial farmers. The two-day Zanu-PF congress resolved that the party would not give in to the demands of Tsvangirai's Movement for Democratic Change party to have its members appointed to senior posts of the coalition government. Zanu-PF said there would not not be any "movement until paramount and decisive steps have been taken for the unconditional removal" of sanctions imposed by the West on Mugabe and his senior party officials.